There are only a handful of places in the world where one can catch Brown Trout that, like their famous cousin the Steelhead, are born in a river and migrate to the fertile waters of the ocean where they grow fast and large before returning to their river of origin to spawn. The most famous of these locations is Tierra Del Fuego, located on the very Southern tip of South America, 6000 miles away from where I'm writing this! 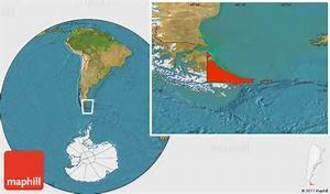 TDF is actually an island, separated from the main continent by the Strait of Magellan. The name Tierra Del Fuego (translation Land of Fire) originated during the explorative period of Ferdinand Magellan, the Spanish explorer who sailed the area in 1520. The natives, fearing intrusion, ignited huge bonfires to discourage ships from coming ashore. These fires cast a glow that could be seen at night for miles across the water, earning the name Land of Fire. 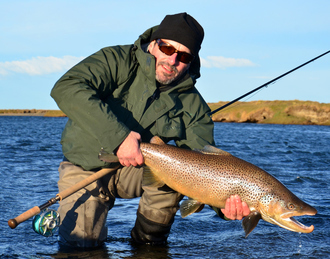 There are two main rivers in Southern Argentina that have large populations of Sea Run Brown trout, Rio Gallegos and Rio Grande. Rio Gallegos, located across the Strait of Magellan to the North of TDF in the province of Santa Cruz, is a much larger river than Rio Grande. While most agree that the average size and largest fish come from Rio Grande, both of these rivers receive incredible numbers of Sea Run Brown trout with the annual runs estimated at 50,000 to 70,000. To put that into perspective, many rivers that we steelhead fish for in the Pacific NW and BC host runs between 5,000 and 15,000 fish annually. Yes, thats a factor of 10X more fish than many of our favorite steelhead streams! 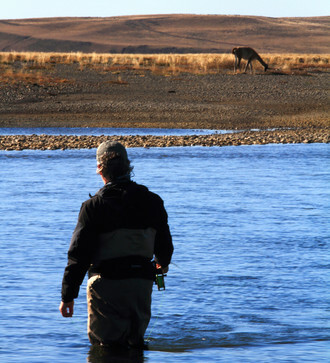 The only way a non resident angler can access Rio Grande is to utilize one of the private lodges, which are each associated with a large ranch or hastancia. There are 4 lodges on Rio Grande that have access to the central 50 km of the river, which begins about 15km above the mouth. The pools in this section are mapped and split into designated beats. 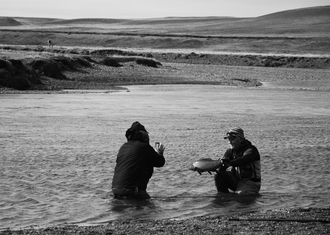 Stream law in TDF dictates that landowners own to the center of the river, so shared beats are then rotated between the affiliated lodges ensuring exclusive access. All of these lodges operate weekly rotations enabling all anglers opportunities to fish productive water each day. Maria Behety has 2 lodges on one side of the river and their pools span 53 km of river front. Across the river from them, the lower end is shared with Villa Maria, then Despedida in the middle, and Kau Taupen on the upper end. There is one main tributary of Rio Grande called Rio Jose Menendez, which forms the boundary between Despedia and Kau Taupen. Many of the fish entering Rio Grande will eventually spawn in the Jose Menendez. Anglers staying at Despedida and Kau Taupen, especially later in the season (March  April), may find themselves fishing this tributary. 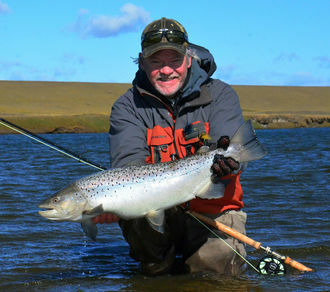 Residents of Tierra Del Fuego wishing to fish Rio Grande have a couple of options. The lower 15 km of the river is managed for local access and offers some great pools. Additionally, Saturday is the turn day for all lodge guests, so the lodges accept local (residents of TDF only  not even all Argentinians can fish it!) reservations on Saturdays to fish their private beats. Rio Grande is simply an incredible river when you consider the fish numbers outlined above. It is hard to fathom 70,000 fish coming into a river that is small enough to cast across and only 80 km in length. The fact that it is comprised mostly of private water and limited to a few lodges makes it even more remarkable. To put this into perspective, consider that the main season for Sea Run Brown trout runs from mid January through early April, totaling just 12 weeks. The capacity when you combine all of the previously mentioned lodges spreads just 42 anglers per week over 50+ km of water. 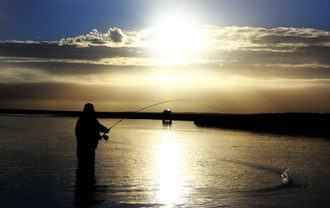 When you look at angling pressure over the entire season, only about 500 total anglers fish Rio Grande each season. We see periods where 500 anglers fish some of our more popular trout and steelhead streams in just one day! This run should be thought of exactly like a summer steelhead run in many of our Pacific ocean tributaries. While there may not be as many fish in the system in the first few weeks of the season, it doesn't take many of those silver rockets to make for a memorable week! The river is also carrying more volume at this time, which certainly favors the 2 handed rod game. As with steelhead, the longer these fish are in fresh water, the more colorful and similar to traditional Fall brown trout they become. Here's a late season shot of a chrome hen next to a beautifully colored male. To me, that is why you go to Rio Grande  to try and catch a mature square tailed male brown trout complete with the blue cheeks, orange halo spots, gold belly, and a nasty hook jaw! After all, these are the same species weve spent many days pursuing in some beautiful rivers in MT, ID, UT, and CO. These are the same fish weve spent hours tying lead eyed double bunny stinger hooked streamers that nearly dislocate your shoulder every cast to try and trick them. These are the same fish that when everything comes together and we land a 20er, we get excited! 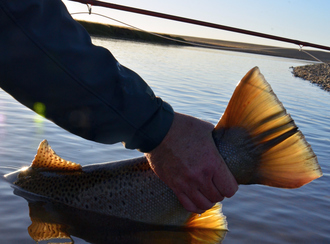 Rio Grande offers a legitimate opportunity to wrap your hand around the tail of a 20 POUNDER! With all of these fish in the river, and so few anglers, one might think it would be really easy to catch them, right? That is certainly not the case. The reality is that these are wild brown trout, and their behavior is typical to that. 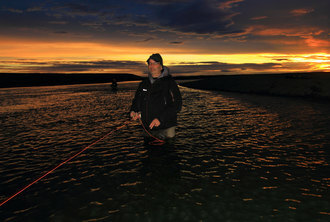 The low light periods (morning and especially evening) are when they become more active and offers the best window to fish dry flies (on a dead drift or skated) or strip and swing sculpin and intruder style streamers. Weight forward floating lines or intermediate tips can be best for these low light techniques. I have caught fish on large articulated flies on both a traditional smooth swing like we use for steelhead, and also just casting strait across to the far bank and stripping it back as fast as possible like we do from the bow of a drift boat on the Missouri River. While these techniques may continue to be productive in the middle part of the day, especially with cloud cover, presenting a smaller nymph during that timeframe is more likely to get attention. The fish settle down when the sun is high or the pool is disturbed. This becomes very apparent by the number of fish you see rolling at various times. It is not uncommon to see several hundred fish roll in an evening in one pool on Rio Grande. My most productive technique for fishing these small nymphs has been to quarter a cast on a slight upstream angle (bigger in deep or fast water) and immediately strip in any extra slack. The fly will sink as the line drifts downstream in the slot. As the fly drifts towards me I take in enough slack not to move the fly, but maintain tension so I can feel it if a fish grabs. 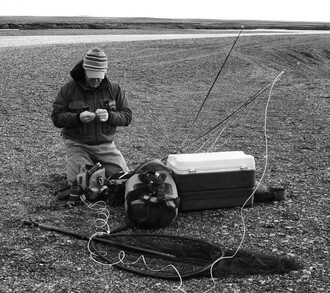 As the fly drifts past and the line begins to swing across the current, I pinch the line like Im going to strip and then slowly pulse the fly forward and back about 4-6 at a time, doing it slowly enough that I never lose tension. The fish seem to prefer that pulsing technique with a small nymph over a smooth even swing. 1. Single hand 8 weight with a 20+ sinking line equivalent to 5.5-6.5 ips sink rate. My pick is the 9 8 weight Sage Method with the Rio Deep 5 Series line. This is a 30 sinking line with a 5.5 ips sink rate. The running line is integrated and thick enough to handle easily, but thin enough to reduce friction on the water. 2. Switch or spey with Skagit head. I love the 6119 Method and threw it all week. The 7110 Sage One was popular with several others, and the 7117 Burkheimer was the favorite of the rest. The Skagit line is preferred for sink tips. The most popular configurations for us were various lengths of T11 and T14. I had my best midday fishing running the Rio Chucker line with 10 of T14. 3. Switch or spey with Scandi head and floating or intermediate tips. This is the rod youll pick up in the low light periods. Your time in TDF, especially these low light periods is WAY too valuable to waste any of it reeling in and changing heads on your rod. Bring one rod and dedicate to the low light skater or streamer game, and the other to the Skagit program. The earlier in the season you go, the broader the river will be, so bringing a longer spey rod makes more sense. For the March timeframe, anglers can easily cover the water necessary to be successful with these shorter switch rods. Other important gear items that need a little more explanation than standard mention on the packing list include tippet. While I typically never use fluorocarbon tippet for swinging flies, the guides down there really believed in it, and asked for it. Therefore, I caught some flak from the group for not having everyone fully stocked up on it. The reason I dont use it for swinging flies is because there is zero stretch in it. 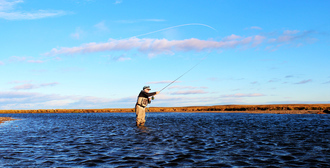 A swung fly is already under tension, so a fish eating it and accelerating the opposite direction can easily exceed the strength rating and break it off on the take. I actually lost what may have been my largest steelhead ever under this exact circumstance. I do use fluorocarbon for nymphing, where were fishing a slack line presentation where a lot of shock is absorbed in the slack pick up. Because of this tendency, the mostly universal rule is that you use monofilament or nylon for swinging flies and fluoro for nymphing or fishing small dries. I continued to use my monofilament in TDF and it did not seem to spook fish. However, the guides had the rest of the group talked into it, and the supply ran low by the end of the week... 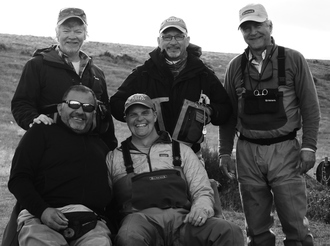 So one night at dinner, I opened the conversation with How many fish have you guys broke off down here? This is a very well experienced group of anglers, and at the end of the conversation, we all agreed that we had broken off more fish than should be typical, and I attribute that to using fluorocarbon. You can see from the photos that the bottom of the river is all small gravel. Felt waders are legal in Argentina and work well. You dont need studs for extra traction. The weather is absolutely amazing and unpredictable there, so be prepared for everything on the same day! It rained on us, it was cold, the sun came out and it heated up, and our favorite  the famous TDF wind did blow at 40 mph on a few occasions. That being said, dont forget your puffy layers and hoodies! Based on my previous experience 18 years prior, I had put together a fly assortment for our most recent trip that included about 36 nymphs, mostly between sizes of 12 and 16, along with an assortment of 24 swinging flies. This box was proven effective, as we caught fish on nearly every pattern in the assortment (the only nymph I didnt was a red copper john). The only problem was that we needed a higher quantity of these smaller nymphs! I had forgotten just how many flies you lose to hooks being straightened, or clumps, which are large sections of an eroded bank that end up falling into the river. Not only are these located right in the middle of the "fishy" current line, but they are covered with very tough grass that does not give easily. The result is a steady regimen of practicing your loop knots to tie flies on! 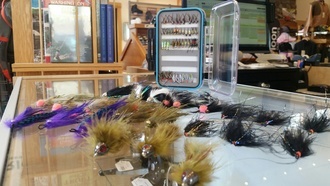 After the return, we have reviewed the fly assortment and expanded the selection to include both beaded nymphs and unweighted nymphs in higher quantities while scaling the assortment of articulated swinging flies back a bit. I have scoured the planet looking at size 16 nymph hooks to test strength, and while these flies are all tied on great hooks, there are just some fish or clumps that are going to straighten you out! Click HERE to see the updated (we improve every year!) fly assortment! (2) or (3) rods: I bring a single hand 8 weight and (2) 6 or 7 weight switch rods. One rod can stay rigged with floating line of clear intermediate for early AM and late evening window, and the other should be rigged with a sinking line in the 5-8 per second range. Bringing 3 rods enables you to keep 2 rigged and have a spare in case of breakage. Sinking line: The Rio Deep 5 is a 30 sinking portion (5.5 ips) with fully integrated running line enabling smooth retrieve of stripped flies (no knots to strip through guides). While the river is small enough that youre not likely to need hundreds of yards of backing, you will see backing and you need to tire these brutes out! The Hatch 7 plus is a best option or the Sage 4280 is a great budget option. 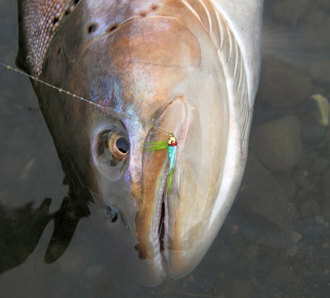 Bring one scandi line  we used the Rio Steelhead Scandi in the past, but the Airflo Rage (30 head is a great option). This line will turn over any versi leader  or go ahead and attach a 12 tapered leader right to the loop of the head to skate a fly. Many 2 handed enthusiasts enjoy casting this longer bellied lighter line. Bring one Skagit style line. For 6 and 7 weight switch rods, we like the Rio switch chucker or the Airflo switch streamer. You can do some dredging with these lines and 10 of T11 or T14 attached to the end of them. Besides being compact enough to turn over these heavy tips, these lines both have integrated running lines behind the heads  meaning you dont need to mess with stripping loops through your guides and fumbling to get a handle on thin mono line. This makes fishing that requires a lot of stripping more productive and enjoyable. Whatever your preference of Skagit style heads are, do make sure you have a variety of tips including 10 of T11 and T14 along! Tippet: Bring a spool of 12lb Maxima for swinging intruder style articulated flies, and a spool of Rio 0X fluoro flex plus (13 lb) to play the small nymph game. 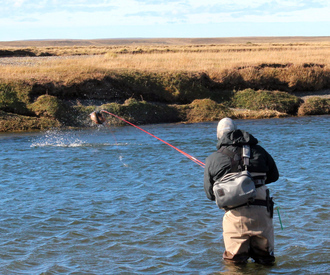 Regardless of fly and style, we typically run about 4 of tippet to the fly when we fish sink tips. No taper necessary  tie a perfection loop on one end and loop it onto your sink tip or versi leader. Tapered Leaders: If you want to skate dries, swing damps, or fast strip buggers across the channel, bring a few Rio 10 tapered Salmon Steelhead leaders. Reels: While the river is small enough that youre not likely to need hundreds of yards of backing, you will see backing and you need to tire these brutes out! The Hatch 7 plus is a best option or the Sage 4280 is a great budget option. Nail knot tyer  although I prefer Albright knots for fish of this size! Scissor clamps  I do pinch my barbs there. Extra sink tips  a spare 10 T11 (as that is your main tip), 10 T14, Versi Leaders if fishing Scandi, and intermediate in 6 -10 lengths can all work in the runs you will see on Rio Grande. A kit bag to keep it all organized in! Flies  bring what you have an inkling to bring, but this assortment has been tested and optimized to cover you for the week of fishing! Theres no way to get around the distance required to travel to TDF. Its nearly all the way to Antarctica! Whatever major city you depart the US from, (we departed the International lag from Atlanta and Houston), its a 8-10 hour journey that starts before bedtime and arrives into Buenos Aires in the early AM. For us, we departed Atlanta at 10 pm and arrived in BA at 8 am. While it is possible to initiate this on a Friday and arrive into BA Saturday in time to catch the additional 3.5 hour flight to the lodge in Rio Grande, we elected to start on Thursday so we could spend Friday night in BA where we had an excellent and reasonable dinner and take in a few of the sights and sounds. After all, you are travelling 6000 miles where you will spend a week and see several miles of a remote river before getting on an airplane to travel 6000 miles home. 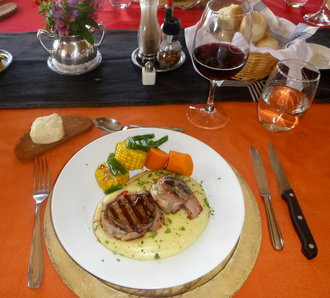 Why not spend a day and enjoy a great meal in BA. Our transfers in BA were excellent and efficient which eliminated any perceived stress in the airport and customs scene. Coming home is similar. The flight departs Rio Grande on Saturday at 9 am, which puts you back into BA at 1 pm. We arranged the same transfer service to pick us up at the airport and take us downtown where we enjoyed a nice lunch and last few glasses of Malbec before returning to the airport for a 10 pm flight back to Atlanta then connections to the NW. I dont know how else to say it, except that this component of this trip was exceptional. Argentina is famous for beef and Malbec and we were not disappointed in either of those categories. In addition to some excellent steaks that started at a restaurant named Don Julio on our layover night in BA, we also enjoyed great pasta dishes, lamb, fish, and poultry. The South American tradition of siesta takes on whole new meaning when you just fished 5 hours and washed a delicious filet down with a couple smooth glasses of Malbec! Ill sum it up like this  in hindsight, we had what I would consider excellent fishing, and the food and wine still may have been the highlight of the trip! Is This Trip Really Worth Taking? Absolutely without a doubt 100% yes. If you are considering taking a big trip, then this is one that should be on the radar. First of all, there are no options out there to really do this trip on a budget. We can drive to BC and fish steelhead on our own by utilizing public access or taking our own boats. 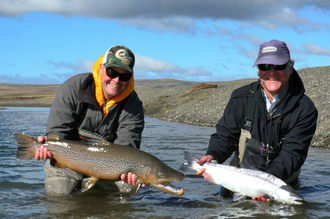 However, Rio Grande is totally private, and these amazing brown trout are only found in a couple places in the world. The setting is so unique, and the fishing, food and wine, and ease of access once you arrive are such that I truly believe this trip is worth the monumental effort. 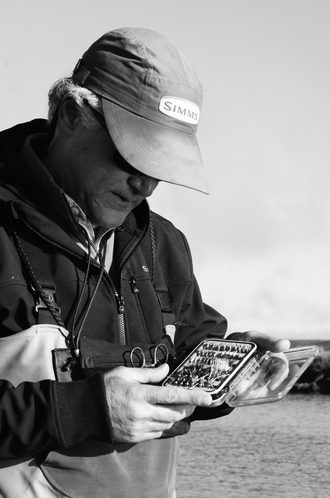 As a trout and steelhead fisherman, we appreciate how difficult it can be to get ONE fish. Even with as many fish are in the river, this fishing is not stupid good. It is hard enough that you will appreciate every single one that you land, and you may have a day when you dont get one. However, the appeal of Rio Grande is twofold. First, there are enough fish in the river that you can get them on your terms. If you want to skate flies, then you can do that, and you will move, boil, and hook fish (especially in the low light periods of day). If you only want to throw 2 handed rods and swing big flies, then you can do that and you will tug on fish (especially in the low light periods!). Were always hesitant to talk about catch numbers, as there are many factors that impact that including conditions, angler experience, and technique utilized. Over the first 2 days of our trip, I landed 3 fish total. 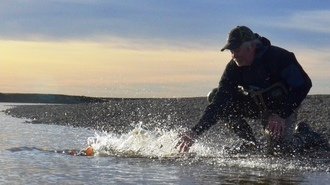 With steelhead fishing we are ecstatic about those numbers if were swinging 2 handers. I, like everyone else in our group, felt that the entire trip was made after those first 2 days. Not one person in our group was disappointed by catch numbers, and we all caught at least one mature male that we got a nice picture with that will go on the wall in the office or above the fly tying desk as a cherished memory of what an amazing place exists on the other side of the globe! Yes, this trip is worth taking and you will not be disappointed! Hastancia Despedida is a quaint little log cabin that is setback just out of site of the Rio Grande at the base of a gentle grassy hill. At first glance one may wonder why it wasnt built along the river bank; however, by the end of the week anglers appreciate the perfect setting. The hill shelters the lodge from the prevailing TDF winds which are often present during the fishing season, especially at night when guests may wish to step outside and enjoy a cigar. The lodge contains three double occupancy guest suites, a comfortable living room that is flanked by a bar on one side and dining table on the other. The accommodations are clean and comfortable, and best of all, the furthest drive you may have from the lodge to your beat on the river is less than 10 minutes! Let me preface this category by pointing out that while the travel distance is great, no part of this trip is limiting  meaning other than checked bag weights, we arent limited on what we can bring. 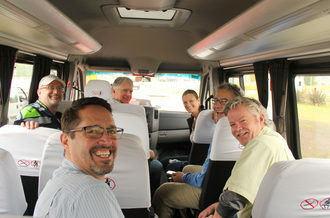 We fly by commercial airlines to Rio Grande where a van (with plenty of cargo space) picks us up. Fishing each day is done with 2 guests and a guide driving in a truck to the river bank and wade fishing. Youll wader up before leaving the lodge and I like to leave with all of my extra layers in a roll top dry bag, my fishing gear in a kit bag, and the rods go on the truck. It is good to be efficient, but the point here is that you should NOT be uncomfortable on this trip because you didnt bring the right things! Laundry service is available for about $10 per load during your trip. Remember, youre a long car ride from Antarctica here! Goretex waders and felt soled boots  no need for studs, but leave the vibram soled boots at home (theyre still slippery)! Gore Tex Rain shell  coldest, windiest days you may find yourself wearing all 3 of these layers  so plan accordingly  not bad to have your base layers size large and an XL rai shell over the top. Also remember layering 3 hoods can get a little uncomfortable. Polarized sunglasses  as always! 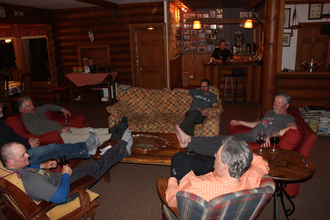 Lodge wear : Jeans or khakis, collared shirt  this isnt formal so be comfortable! There is no cell or internet service here, but a sat phone does work. This truly is a trip of a lifetime, so prepare for success! Feel free to call or email with any questions about this amazing fishery: steve@redsflyshop.com; Red's Fly Shop 509-933-2300.